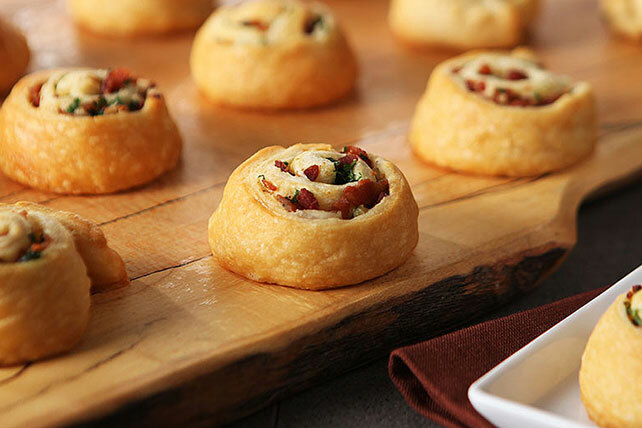 Try our Bacon-Cheese Crescent Pinwheels that are guaranteed to please. Bacon-Cheese Crescent Pinwheels contain delicious bacon crumbled and rolled into a flaky crescent roll. Unroll dough. Separate dough from each can into 4 rectangles; firmly press perforations together to seal. Spread dough with bacon mixture; roll up, starting at one short end of each rectangle. Cut each roll crosswise into 4 slices; place, cut sides up, 4 inches apart on baking sheets. Flatten slightly. Always check the sell-by and expiration dates when purchasing groceries. The sell-by date is the last date on which the product should be purchased, whereas the expiration date is the last date on which the product should be consumed.